IN CAMBODIA RACIST RHETORIC BRINGS DEATH-THREATS TO HUMAN RIGHTS ACTIVIST: DOES IT ALSO TARNISH THE CHANCES OF POLITICAL CHANGE? Attacks on human rights activists in Cambodia and around the world mostly come from the agents and the guardians of the status quo – the police, army, militias, and from private security companies deployed by major corporations seeking to block workers rights. But the death threats in this case, delivered by phone, email and Facebook to human rights leader Ou Virak did not come from government quarters, but from the virulent opponents of the ruling Cambodian People’s Party(CPP) led by long-serving prime minister Hun Sen. The hate-speech was triggered by a CCHR’s letter to opposition leaders representing the Cambodia National Rescue Party (CNRP), urging them to stop using racist language against the Vietnamese, the largest foreign community in Cambodia. This letter touched a raw and racist nerve among many opposition supporters who had been fired up by rabble-rousing speeches over the “Vietnamese threat“ to their nation. International human rights groups acknowledge there are genuine grievances including illegal immigration and some land-grabbing by Vietnamese companies [as well as many other foreign companies that Rainsy does not mention in the same breath].But genuine issues when suffused with racial hatred and propaganda, are even less likely to be seriously addressed. Contentious history, complex Khmer-Vietnam relations, and its legacy on Cambodian human rights. Yet back in the early 1990s Ms. Kek told this correspondent how she was bitterly disappointed that so many of her NGO staff at Licadho harboured resentment towards any application of human rights principles to cover discrimination against Vietnamese residents in Cambodia. 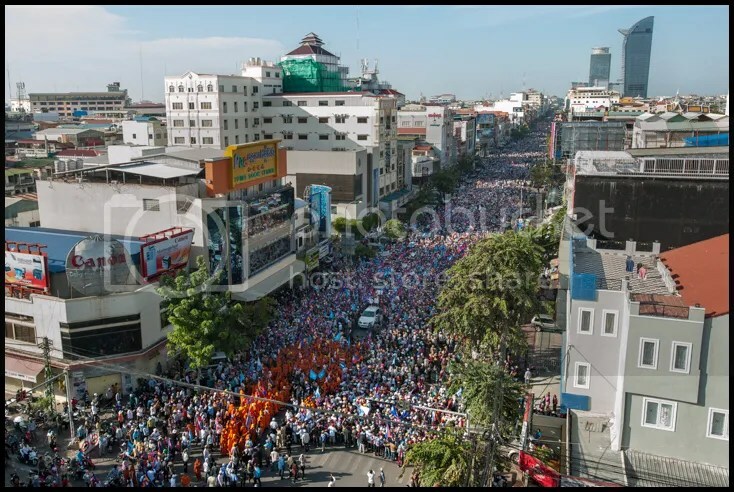 There is a perennial fear among some Khmer people, that Vietnam has evil designs to swallow Cambodia based on a mixture of folklore, paranoia, political agitation and a jaundiced grasp of history. The burgeoning anti-Vietnamese constituency is bolstered by their reading of Vietnam’s occupation of Cambodia from 1979-1989, during a period of civil war against the Khmer Rouge, as proof of a Hanoi-orchestrated plot to colonise Cambodia. Vietnam is often depicted as the hidden power behind Hun Sen, the longest-serving prime minister in the region, who enjoys special historical links to Hanoi dating back 30 years. On the other hand millions of Cambodians share a different memory of Vietnam’s intervention in 1979 that rescued them from genocidal grip of Khmer Rouge regime and the “Killing Fields” at a time when Sam Rainsy was living comfortably as a banker in Paris. The real history of Khmer-Vietnamese relations is far more complicated than Rainsy’s racism or on the other side the complacency of Hun Sen’s government who never seriously addressed the legitimate concerns. An UN-backed special tribunal has been conducting trials in Phnom Penh since 2006 to hold the former Khmer Rouge leaders accountable for crimes against humanity and genocide. In the first democratic election in 1993 under the auspices of the UN peacekeeping mission (UNTAC), Sam Rainsy was required to delete his countless references to the“Yuon” in his prepared speech, which a Khmer-speaking UN official Tim Carney judged to be inflammatory and offensive. However in the 1998 election Mr Rainsy was criticised by UN experts for resorting to the same tactic. Since the September 2013 election there has been a major controversy over possible election regularities and the opposition demand for a fresh election and calling for the prime minister to step down. The opposition has boycotted parliament, despite winning an impressive 55 seats with the ruling CPP gaining 68 a loss of 24 seats. At the same time unrest has intensified with a nationwide strike of garment workers who are demanding a living wage and are also backing the political opposition calling for Hun Sen’s resignation..
During protests outside of the Canadia factory on Veng Sreng road on January 3, 2014, there were many reports of Vietnamese shops being targeted, looted and completely destroyed by protestors. “These actions are being left un-condemned by the leadership of the CNRP” says Virak “, which brings up clear concerns as to what the CNRP would do if in power. A deepening vein of racism tainting the opposition’s campaign to unseat entrenched ruling elite around Hun Sen is likely to prove counter-productive in the long term. At a time when the opposition is buoyed by unprecedented popular support at the polls and getting closer to achieving power, Vietnamese-bashing is not the best way for them to convince the sceptics and the international community, that they could do a far better job than the CPP of running the country. Both Hun Sen and his nemesis opposition leader Sam Rainsy are the same old leaders that have dominated Cambodia’s political life for far too long. In the last election the role of youth voters role a generation of new voters, had unprecedented impact on the spirit of the election campaign. Tom Fawthrop is the co-author of Getting away with Genocide? Elusive Justice and the Khmer Rouge tribunal Pluto Books (2004).